“I have the audacity to believe that peoples everywhere can have three meals a day for their bodies, education and culture for their minds, and dignity, equality, and freedom for their spirits.”—Dr. Martin Luther King, Jr.
Next week, as our country endures a political change that produced substantial social divides across racial and social-class lines, it is appropriate to remember Dr. Martin Luther King, Jr.’s legacy and the progress made during the civil rights movement. Due in part to his work, we can celebrate African Americans’ equal access to public accommodations, protection against racial discrimination in employment, and progress in voting rights. However, there is much work to be done. Policymakers should channel Dr. King’s efforts to combat racial discrimination and economic inequality in order to fix the unequal educational opportunities for children of color in America. In a recent paper, Stanford professor Martin Carnoy and I find that attending a high-poverty school lowers math and reading achievement for students in all racial and ethnic groups, and the chances of ending up in such a school are largely determined by a student’s race and ethnicity and social class. Poor students are defined as those who are eligible for free lunch programs. *High-poverty schools are those in which 51–100% of students are eligible for free or reduced-price lunch. Lower-poverty schools are those in which 26–50% are eligible, and low-poverty schools are those in which up to 25% are eligible. Data are drawn from the National Assessment of Educational Progress microdata for eight-grade math students in 2013, taken to be representative of all students. Minor differences could be found if other samples for other grades or subjects were used. Source: Based on “Five key trends in U.S. student performance: Progress by blacks and Hispanics, the takeoff of Asians, the stall of non-English speakers, the persistence of socioeconomic gaps, and the damaging effect of highly segregated schools” by Martin Carnoy and Emma García (2017). As the chart shows, poor children are likely to end up in schools where a majority of their peers are also poor. 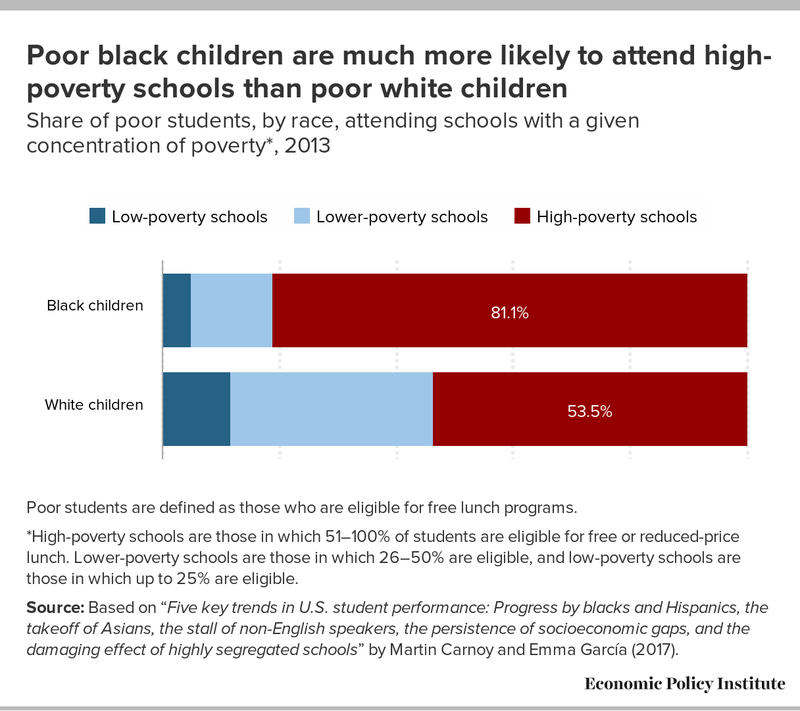 For poor black children, the likelihood of attending a high-poverty school is even higher. While half of poor white students attend high-poverty schools, about eight in 10 poor black students attend schools with a high percentage of poor students. Since attending high poverty schools lowers math and reading achievement, the current system, which includes segregation by race/ethnicity and by socioeconomic status, shortchanges children attending these schools and challenges their future economic prospects and potential social mobility. In order to address the black-white achievement gap, policymakers should strengthen PK-12 public education, invest in after-school and summer enrichment programs and improve housing policies. These programs would reduce inequities in education.